Driving on U.S. 26 and State 6 on the way to the Oregon coast, you’ll pass through what’s known as the old Tillamook Burn.The name commemorates the forest fires that raged through this section of the Coast Range between 1933 and 1951, obliterating some 355,000 acres of old-growth rain forest. But today, instead of a charred wasteland, you’ll see an endless expanse of second-growth forest brimming with wildlife, birds, and blossoms. This miraculous regeneration is due, in large part, to community replanting efforts that began in the 1950s―72 million seedlings have been planted by hand. The Tillamook Burn’s recovery and regrowth has been so complete that, in 1973, the area was designated as the Tillamook State Forest. Though it would take weeks to explore all of the forest’s trails, you can get a taste of Tillamook’s riches on two easy hikes. The 2-mile round-trip hike to University Falls takes you close to the 1,596-foot summit of State 6. After walking through groves of alder, you’ll come to the waterfall, whose silvery spray drips from bright green mosses and fills the surrounding forest with its sound. To reach the trailhead for University Falls from State 6, turn south onto Beaver Dam Rd., a gravel road just past milepost 33; look for the road beside a large open area with a gravel stockpile. Drive 3/4 mile, then turn right onto University Falls Rd. Following the trailhead signs, continue 3 miles to the University Falls parking area. 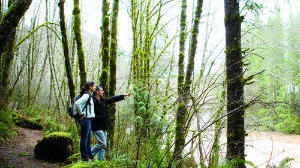 For a longer hike, take the Wilson River Trail, which traverses a wild stretch of the Wilson. In April, the runoff-gorged river races westward toward Tillamook Bay. A 7-mile round-trip segment of the trail winds through groves of alder, Douglas fir, and hemlock; this month, look for three-petaled white trilliums among the swordferns and Oregon grapes. Along the trail, six wooden footbridges span foaming tributaries of the Wilson River (beware: three of the bridges have a wooden railing on one side only). Wilson Falls, a photogenic cataract that plunges down to the river from a high cliff, marks the 2-mile point of this hike. The trail ends at the 3.5-mile marker; from here, retrace your route back to the parking area. The Wilson River Trail begins at the signposted Jones Creek Campground. To reach it, exit State 6 at milepost 22.7 and go north. The trailhead is prominently marked from the day-use parking area. WHERE: Tillamook State Forest begins about 25 miles west of Portland. FYI: Before hiking in the forest, pick up the Tillamook State Forest Map & Guide from the Oregon Department of Forestry. CONTACT: Oregon Department of Forestry, Forest Grove (801 Gales Creek Rd. ; 503/357-2191) or Tillamook (5005 E. Third St.; 503/842-2545).